Weeks ago the leg of my 5 years old boxer was very swollen and he even walked a little limp, time later a kind of wound was formed and until today it has not been removed. Thought my dog does not complain about anything, does not cry, or anything, keeps eating well, runs without any problem now, and everything normal. Although from time to time I've noticed that he licks his leg. What could it be? Is it a disease? Could it be dangerous, contagious, ... ? Or will it heal with the passage of time? I know you have mention in the answers to take my dog to the veterinarian and I do really want to take him asap but vet is on vacations and won't be here until January. So please tell me what can I do to help my dog for now? Should I bandage his leg? Something else? 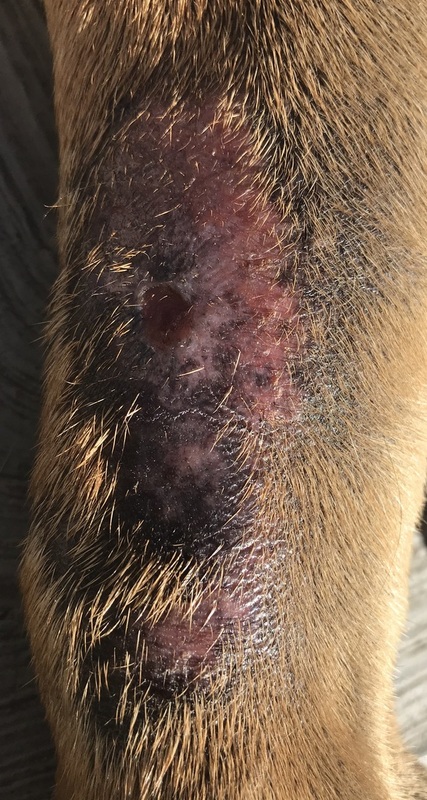 I luckily could contact the current vet and told me it is a skin fungal infection. And vet recommended a cream. Does he naturally have black skin? It looks like he does but it is difficult for me to tell. I was worried about necrosis, but which would occur from a spider or infected wound. However, for it to be that, it would have to be infected a long time. The bite does resemble that which are left by the chelicerata of a spider. It also could be an allergic reaction. If he's licking at the irritated area a lot, that would account for the hair loss. It's an untreated wound that should be seen by veterinarian. 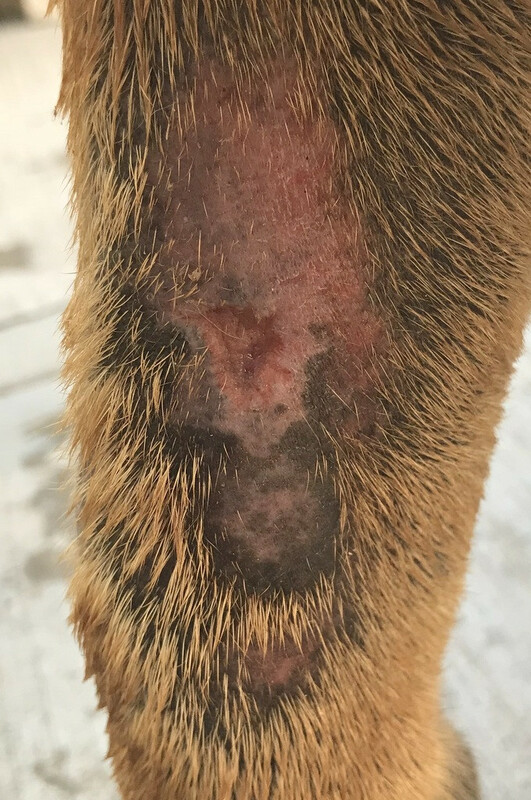 Only a licensed vet can reliably diagnose what kind of wound this is. If the dog continues to pay attention to it it clearly still affects the animal and further long term damage or harm should be mitigated as soon as possible. Well it could just be an abrasion, a scrape from falling down. Or it could be cancer, worst case. Or probably a dozen other things (none of which are that risky to a healthy human - but wash your hands). One can't really say for sure from a visual inspection. Given that it has been there for weeks, if it was just a scrape then it may be infected. You might have to cone the dog if it licks the wound a lot and makes it worse. Could also try Neosporin antibiotic ointment. A veterinarian is the way to go. Our dog currently has a long lasting wound and getting it checked cost about $150 :( Vet did a biopsy, we put some creams on it. Still not 100% sure what it is. Not the answer you're looking for? Browse other questions tagged dogs health injury skin-condition veterinarian or ask your own question. How can I prevent a dog from removing a splint/bandages? How much activity is too much for my older dog? 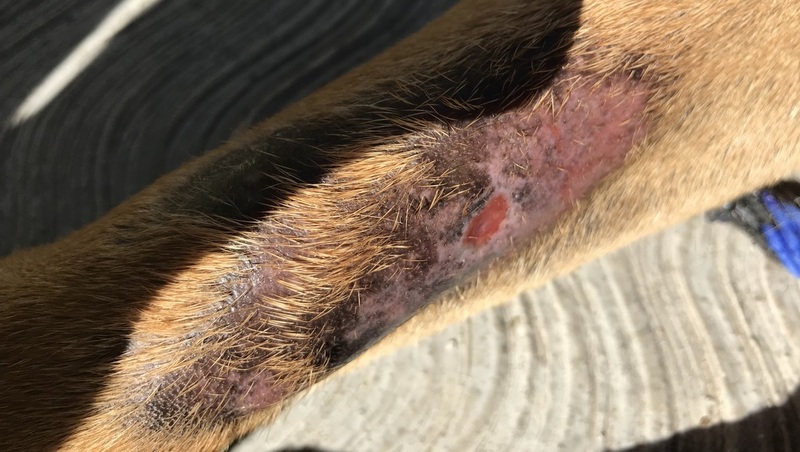 What could cause my dog's rash and yellow flakes besides allergies? When can I remove my dog's bandage? What could be this on gum of boxer?